Judy Haning has taught the tiniest tykes to eager adults how to pick up a needle and thread—and how to create pride-worthy garments. Judy Haning with students Hadasa Peters (right) and Nora Nemec (far left). Not wanting to keep the next generation in the dark, Haning took matters into her own hands and crafted an answer: her own sewing school. 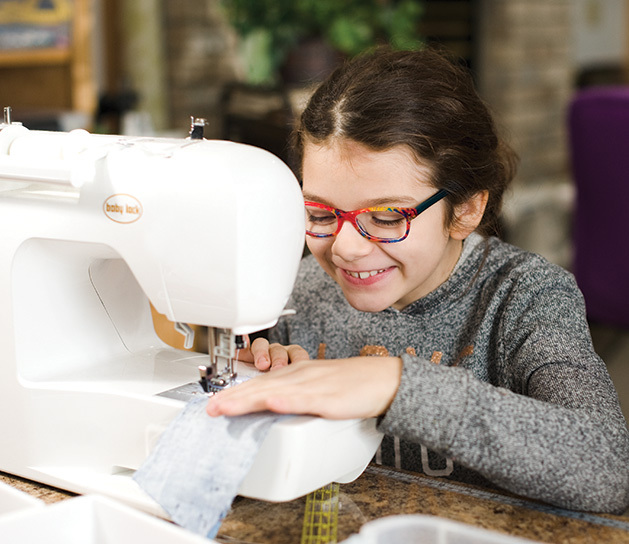 With classes held in the basement of her Chanhassen home, Haning has taught the tiniest tykes to eager adults how to pick up a needle and thread—and how to create pride-worthy garments. Kids hoping to pick up the new skill can jump in at any time, with Haning offering classes for students of all levels year-round. Even if sewing isn’t a skill someone wants to pick up for the long term, they can take a quick crash course on the craft. Haning has also hosted Girl Scout troops in the area, teaching them how to work on a project they can take home that day (and earn one of those coveted patches, too).